Born and raised in Cornwall - the UK's surfing capital, Ashleigh grew up surrounded by the ocean with an ingrained love of surfing. She became one of the UK's standout female competitive longboarders and has spent much of her life traveling around the globe to some of the worlds very best surf destinations. At the age of 13 she was given an old canon film camera that captured her imagination and creativity. Learning with the trial and errors of traditional film photography only quelled her willingness to learn the skills and techniques required to take great pictures. Capturing the rugged beauty of her home beaches, powerful Atlantic Ocean swells and documenting her travels came naturally to her. Since moving to California in 2015 and spending some time putting down roots with her husband in the beachside town of Oceanside, she found a new passion in taking photos of the beautiful waves, surfers and beach scenes in her new hometown. Her presence at the beach was noticed by local surfers keen to take home moments of their last session and in December 2016 San Diego Surf Photos was born out of a single beautiful photograph of an old time surfer in South Oceanside. Over the past couple of years Ashleigh has been fortunate to work with some incredible and inspiring surfers, individuals, companies and families to capture their very best moments in the water and on land. In addition to surfing photography she offers portraits, family photos, events and for brands and companies looking for great images. You'll find her most days either surfing her hometown breaks, or behind her viewfinder at one of her local San Diego beaches. She plans to keep growing her photography services further with a special emphasis on capturing moments of local everyday surfers, the stories of passionate people and brands and documenting her worldly travels around the globe. 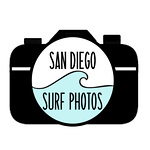 If you have any questions or would just like to say hi, are interested in any prints from my website, scheduling a photo shoot or would like to inquire about licensing any photos please drop me an e-mail at sandiegosurfphotos@gmail.com or fill out the CONTACT US form on the website. Follow our social channels for the latest public session locations, news, special offers & awesome surfing photos!